Man, I love Thanksgiving! “Love” is an exaggeration. It’s an understatement, if anything. I love, love, LOVE opening my google reader and reading all the Thanksgiving recipes, drooling over photos, and scribbling down recipes, notes, and suggestions for Thanksgivings (and meals) to come. Most of the free mental space in my brain, in fact, is dedicated to thinking about Thanksgiving and food. I have to laugh at myself here because it’s typical that, for the amount of time I spend thinking about Thanksgiving and for the amount of inspiration out there, I’ve done nothing in terms of choosing what recipes to use next week (I could feed off ideas forever; the “getting things done” part is always hardest for me). Thanksgiving is less than a week away, giving me a little bit of time, but if next week is anything like this week in terms of passing by WAY too quickly, then I’m in trouble! So, even though spiced pumpkin bread isn’t really a Thanksgiving recipe, I felt compelled to make it and share it for a couple reasons. 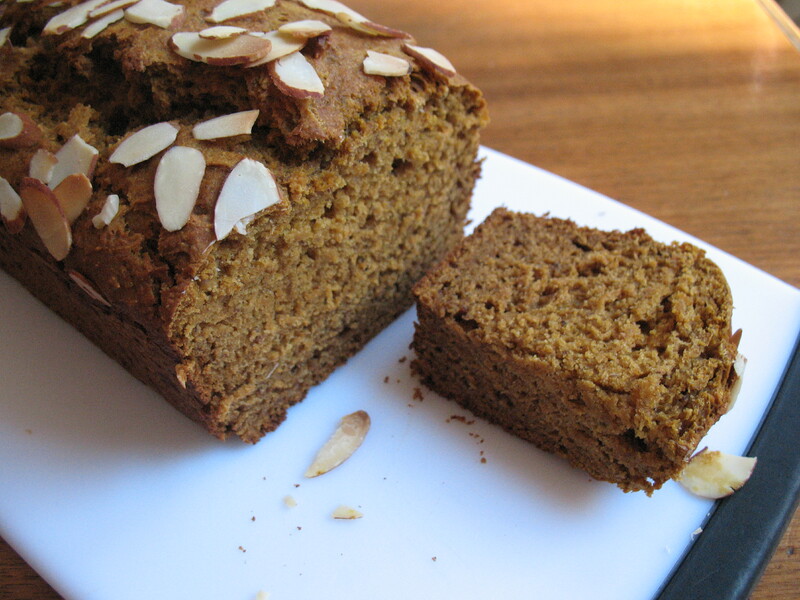 The first is that it’s full of pumpkin and makes your kitchen smell wonderful while it bakes. Second, it seems like a great addition to a post-Thanksgiving brunch spread! My family never did this, but I think I’m going to weasel the day-after brunch into my own Thanksgiving tradition. The bread is perfect, just another great recipe from America’s Test Kitchen! Good luck with your own Thanksgiving preparations!!! Notes: I switched out the granulated sugar called for in the original recipe for honey, and, desirous of a less sweet finished product, added less sweetener than the original. I also threw in some ground flax seeds for good measure, but they are totally and completely optional. 1. In a small or medium saucepan, cook pumpkin puree, honey, cinnamon, salt, and nutmeg over medium high heat, stirring constantly for 5 to 7 minutes or until mixture is thick and glossy. Take off heat and cool. To hasten the cooling process, stir or whisk mixture vigorously for 5 minutes. 2. 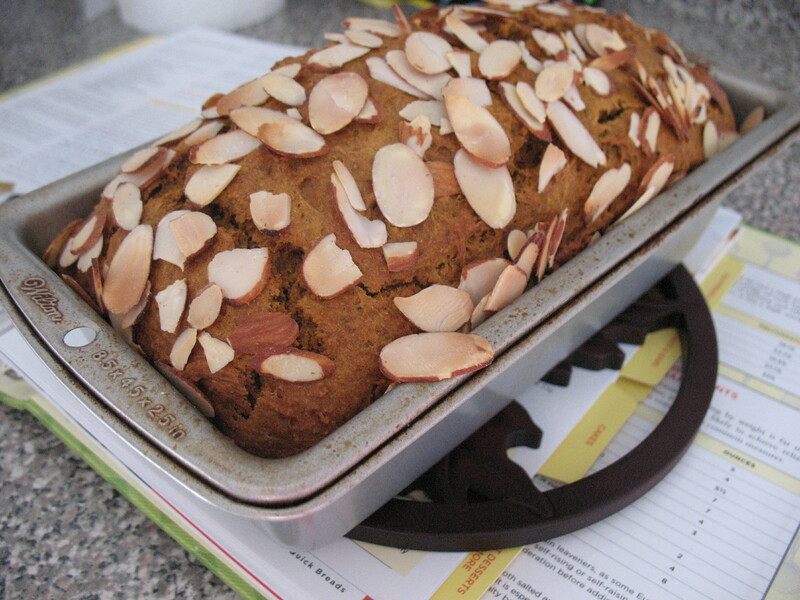 Preheat oven to 350 degrees F. Grease an 8 ½ by 4 ½ inch loaf pan, and place loaf pan on a baking sheet. Set aside. 3. 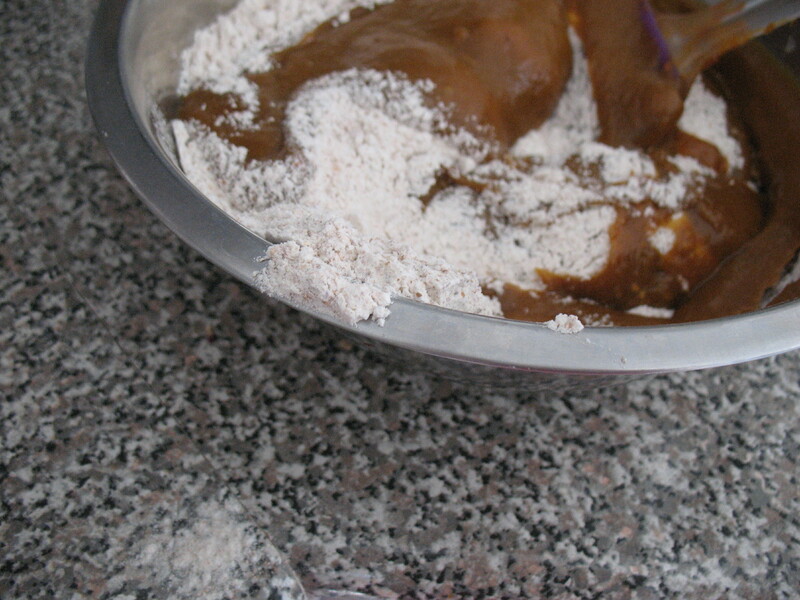 In a large mixing bowl, whisk together flours, ground flax seeds (if using), baking soda, and baking powder. In a separate bowl, whisk together cooled pumpkin mixture, butter, eggs, and vanilla. 4. Fold liquid ingredients into dry, taking care not to over mix. The batter will be thick. 5. Scrape batter evenly into prepared loaf pan and smooth top. Bake loaf 45 to 50 minutes, or until a cake tester comes out with just a few crumbs attached, rotating loaf pan halfway through baking time. 6. Let loaf cool in pan 10 minutes before removing loaf and placing it on a cooling rack. Cool loaf at least one hour before serving. Store loaf either covered tightly with plastic wrap or in an airtight container at room temperature up to three days. I made this last week, it was delicious! The only difference was that I added a little leftover pumpkin pie filling I had in the fridge, which made it extra dense and moist. Mmmmm. Great recipe! Click here to receive email notification of new deliciousness from baketivities!